Wonderful floorplan w 4 patios (3 w mtn views), and walkout lower level. Hardwood floors on main level. Upgraded open staircase & exposed hallway. High ceilings, taller doors & plantation shutters throughout. Spacious Office w glass doors just inside foyer. Gourmet Kitchen w island, eating bar & walkout to deck, staggered cabinets w crown moldings, quartz counters, SS appliances (5 burner gas range), vent hood & pot filler. Vaulted Living Room w gas FP. Upper level vaulted Master Bedroom suite w balcony. Grecian spa-like Master Bath w dbl sized garden bath, open shower. 2nd upper BR w en-suite Bath. 2nd floor laundry. Walkout Lower Level w Family Room, gas FP, wet bar, 3rd BR w ensuite full Bath, finished storage. Quiet cul-de-sac location. Active & engaged community boasts an Italian-style swimming pool & hot-tub area, & directly accessible recreation paths & park areas. 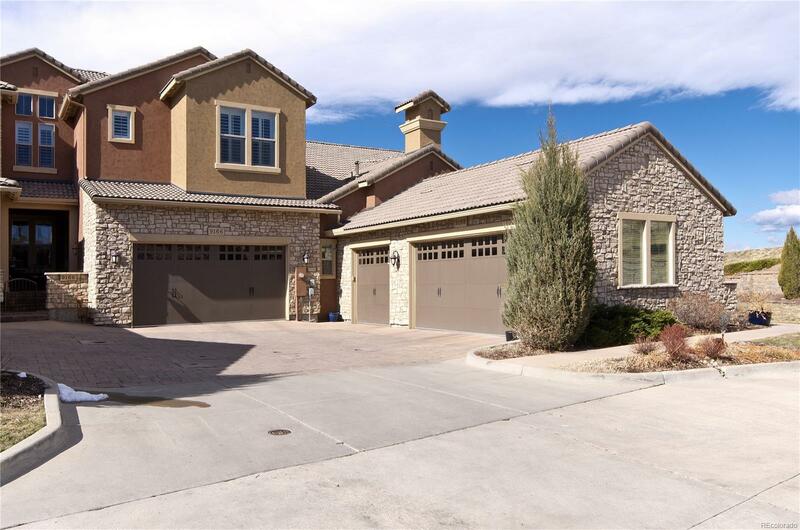 Close to excellent Highlands Ranch shopping, dining, entertainment & recreation amenities.